A water main break caused a massive sinkhole that swallowed part of a city bus Friday morning. It happened about 8:30 a.m. on Kaumakani Street in Hawaii Kai. The break caused the road to give way just as Bus Route 231 was passing over. The back wheel was stuck in a large sinkhole for several hours. “And then the bus actually passed over the road and front wheel passed over and all of a sudden the back wheel just went down. 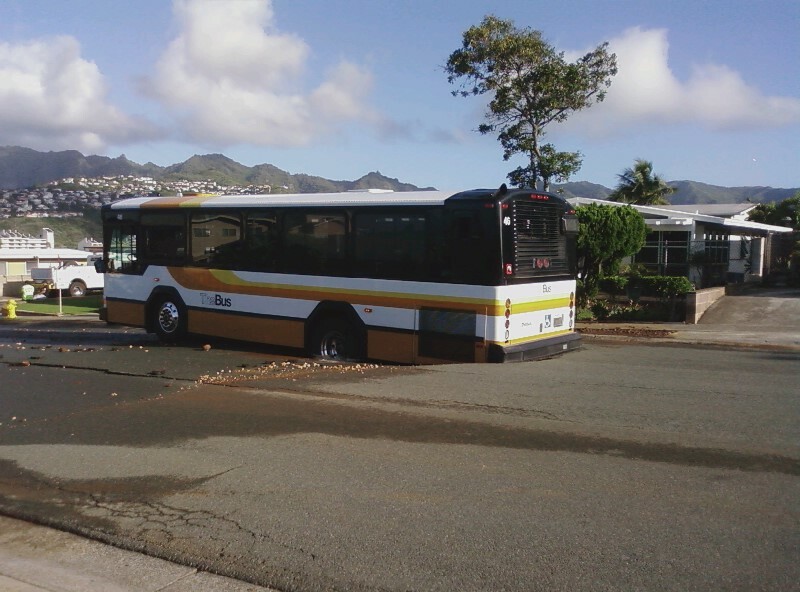 thats when the water started gushing out so the bus was stuck in there couldn’t move and actually the bus held down the water,” said Albert Yuen a resident in the area. Bus officials say no passengers were on the bus at the time, and service was not impacted. The bus was pulled out of the sinkhole about 2 p.m. Friday afternoon, and water main repairs got underway. This entry was posted in Pictures and tagged Hawaii, sinkhole. Bookmark the permalink.